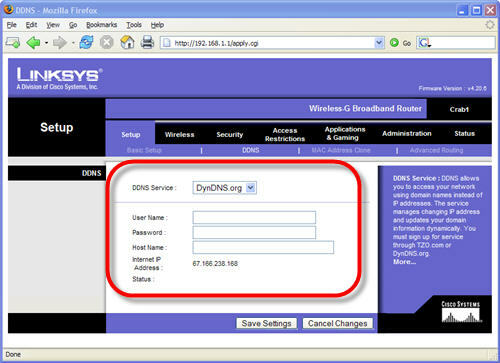 All of our recorders have the ability to add a service like this that will relay the IP to this service which means you only need to remember mydomainname.dyndns.org as an example and not a sequence of numbers that will in the future change . Setup your account with one of these services. I prefer DYN . Then you can watch this video that will show you what settings need to be changed in your recorder. Keep in mind that many routers will do this and in some cases it is better to just add this service using the routers built in settings. In my case i have an old Cisco router . I chose my Username and my password to match my accounts information and i added the HOST NAME that they provided me . I saved the settings and voila! My router is now updating my DDNS service without the need of any other device. I chose this route as i can remote log into my home server using this method and not rely on my recorder to keep it updated as it is another task it has to accomplish. If you have any questions or concerns please give us a call we will gladly help you with your setup. As just a customer using the ultimate mini dvr, having used both dnydns and no-ip, I would recommend to other users to choose no-ip if you want a free account. Dyndns is great if you need a paid account for multiple host accounts, but creating and keeping a free account going there is laborious, requiring manually logging into your account every 30 days. No-ip is truly hassle free FREE, and my security camera king dvr [and nvr’s as well I’m sure] acts as the updater without the need to plug in the info to the router. Some older routers don’t include no-ip as a ddns choice and so in that case, the dvr works perfectly as the updater. Just some thoughts from a customer to other customers. I totally agree with you and I have been using no-ip for years for various applications. I am also very happy that they are one of the choices in the security King products software. I personally used DYN. I only have to pay 18$ a year to have these services. For a free account yes you have to log in every so often if not they will just cancel the service. No-ip is a good alternative.